Chinese engagement with Greenland will be an important test case for the country’s Arctic policy. Since China began to deepen its engagement with the Arctic region over the past decade, culminating in the publication of the country’s first White Paper on the region in January this year, much global attention regarding Chinese Arctic interests has centered on Sino-Russian cooperation, including joint ventures in Siberian fossil fuel development and the opening of the Northern Sea Route to Chinese cargo traffic. However, there is another part of the Arctic that has also become a focal point of Beijing’s evolving Arctic diplomacy, namely Greenland. As the massive ice sheet on the island continues to erode, along with surrounding sea ice, Greenland’s emerging economic potential has caught the attention of many countries, but China has been distinct with its economic diplomacy in Greenland, which has not only included emerging mining opportunities, but also in the areas of infrastructure planning, tourism, and scientific cooperation. Greenland is part of the Kingdom of Denmark, and the centerpiece for Danish interests in the Arctic. In 2009 the island achieved “self-rule,” meaning that most governmental portfolios are under Greenlandic jurisdiction save for defense and foreign affairs. China’s Greenlandic engagement has sparked concerns in Copenhagen, and may factor into the looming question of whether Greenland opts for full independence in the coming years. Chinese firms have sought to invest in Greenland’s emerging mineral wealth, which is becoming more readily accessible due to climate change. The most visible example is the rare earth elements, uranium, and zinc mining under development at Kvanefjeld by Australian firm Greenland Minerals and Energy, in cooperation with China’s Shenghe Resources. In Greenland’s far north, a zinc mine is planned at Citronen Fjord which would be overseen by Perth-based Ironbark, which signed a memorandum of understanding with China Nonferrous Metal to assist with that project’s development. As well, General Nice, a Hong Kong-based company, currently holds the rights to a potential iron mine at Isua in western Greenland. The same company ran afoul of the Danish government when it attempted to purchase an abandoned U.S.-built naval facility at Grønnedal, only to be blocked by Copenhagen. According to reports revealed in April 2017, there were concerns the sale might offend the United States, which still operates a military base at Thule in northern Greenland. There has been a growing demand in China for adventure and ecotourism, with the Arctic (and Antarctica) becoming more popular as alternative destinations, and opportunities have appeared for Chinese firms seeking to develop Greenland’s nascent tourism industry. In next-door Iceland, Chinese visitors arriving at the country’s main airport at Keflavik jumped from about 9500 to 86,000 between 2007 and 2017, and there is a debate in Nuuk about potentially tapping into the overall growing demand for Arctic tourism, including from Asia. Chinese firms are being considered for the expansion of three airports in Greenland, which could accommodate expanded tourist traffic, a development which is reportedly worrying Danish authorities. Beijing is also seeking to construct a scientific research base in Greenland, with these plans being outlined by Chinese researchers at the October 2017 Arctic Circle conference in Reykjavík. The exact location of the facilities has yet to be determined, (likely in western or northern Greenland), but if the project does go forward, it would be China’s second such station in the Arctic. Beijing opened its Yellow River station on Svalbard in 2004, and there is also a joint Sino-Icelandic facility for the study of auroras under construction in northern Iceland. Considering the ongoing activities between China, as the world’s second-largest economy, and Greenland, an island with abundant natural resources, the relationship between two nations has been very market-oriented, which can be interpreted as a strong signal of Nuuk’s interest in pursuing further sovereignty given its decades-long independence movement. China has been targeted as one of the numerous sources of foreign capital and investment, along with other non-European economies such as Canada. Nuuk, in building diplomatic ties, has been actively embracing Beijing’s ambition for an overseas economic presence in the Arctic. Besides preparations to open mutual representative offices in Beijing and Nuuk, in October 2017, Kim Kielsen, premier of Greenland and head of one of the island’s dominant political parties, Siumut, led a delegation to Beijing to strengthen cooperation in the areas of fisheries, mining, and tourism as well as other sectors. However, compared to many other stakeholders in the Arctic, Nuuk’s reaction toward China’s Arctic White Paper has been relatively lukewarm, which is probably a product of Greenland’s small economy status, steadily increasing Sino-Greenlandic economic relations, and the upcoming parliamentary election in Greenland. Earlier this month, Kielsen called for the election on April 24, with economic issues being high on the campaign agendas. Like his predecessor, Aleqa Hammond, Kielsen and his party hold a positive attitude toward foreign investment in mining on the island. Although the other two parties in the current government, namely Inuit Ataqatigiit and Partii Naleraq, hold different opinions on the future of the mineral sector, especially uranium mining, the coalition nonetheless chose to cooperate in this area, addressing potential disputes over mining activities. Additionally, the government of Greenland has issued a number of mineral exploration licenses along with several exploitation permits. Therefore, while there is still some time before the election, the move toward welcoming further foreign investment, including from China, shows no sign of reversal. Even though the relationship between Beijing and Nuuk has grown considerably closer in recent years, there are still obstacles in the way of a greater Chinese economic presence in Greenland, which include the domestic-level bureaucracy on the island, the uncertainty of the time required to obtain licenses to commence actual mining activities, potential opposition from local communities over the effects of mining on the environment and traditional economic activities, not to mention possible pushback from Copenhagen. 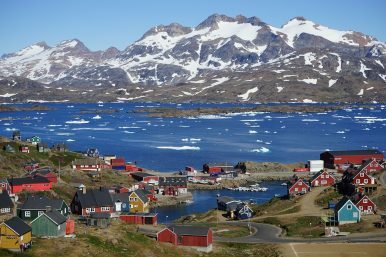 For example, a report by the Danish Military Intelligence Service released in December last year stated that while Chinese diplomacy in Greenland was primarily commercial in nature, there were nonetheless risks involved with Chinese investment given the comparatively small size of the Greenlandic economy. Greenland is, and will continue to be, a crucial test case for China as the country’s Arctic policy deepens in the midst of intense international attention, and questions about how the great power can connect with the High North in spaces far away from its territory. Mingming Shi is a project manager for the journal Icelandic Times, and is a Master’s student in international relations and Arctic politics at the University of Iceland, Reykjavík. Marc Lanteigne is a Senior Lecturer at the Centre for Defence and Security Studies at Massey University in Auckland, New Zealand, and is the editor of Over the Circle, a news blog covering Arctic affairs.